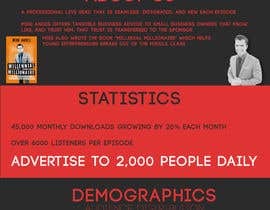 Create an infographic for our podcast show... 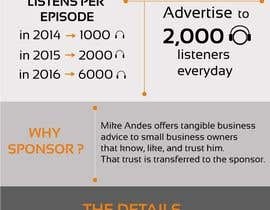 The infographic will be used to attract episode sponsors. 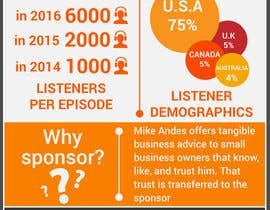 I attached an example of another podcasters sponsor page. It should show all relevant info and then I will need PSD (and PDF) so that I can edit the numbers as we grow. Do you have the image (1450232142.png) of a higher resolution? hello. The branding for your book and your podcast are very different. Are you sure that you want to diverge from your podcast current look and feel. This may be confusing to potential sponsors and other interested parties. Hello! 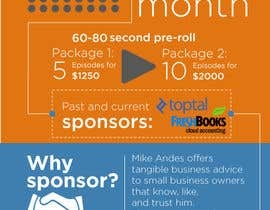 What size of infographic do you need?